Called it. This is the new promo poster for Games of Thrones Season 6. Spoiler alert. 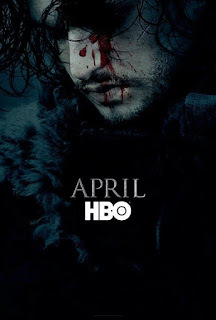 The last time we saw Jon Snow, he was lying in a pool of his own blood in the snow after he was stabbed by his brothers of The Watch. We're supposed to think he's dead but I've been following some of the spoilers from production and I knew that Kit Harrington is still in the show. Anyway, I still don't know how alive he is. There are rumors he's coming back as a wight or he gets resurrected by Melissandre. Whatever. I'm excited for the new season.